Nigel Boyle, Professor of Political Studies and Founding Director of Pitzer’s Institute for Global/Local Action & Study (IGLAS). 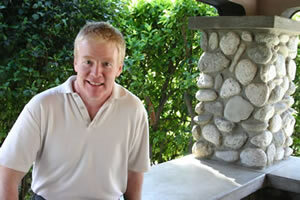 Claremont, Calif. (June 8, 2012) — Pitzer College Professor of Political Studies Nigel Boyle, an expert on European politics, comparative labor relations and World Cup soccer, has been named as the founding director of Pitzer’s Institute for Global/Local Action & Study (IGLAS). He has also been appointed associate dean for global-local programs and IGLAS chair in political studies. In his new role, Boyle will build on the institute’s current programs and its mandate to prepare students to become innovative, problem-solving citizens of the world. A self-described Irish lad with a British accent, Boyle is European by birth and an Europeanist by profession who became immersed in local causes soon after arriving at Pitzer in 1992. When Boyle began teaching about labor politics abroad, his students quickly became curious about worker issues closer to home. “Within two years of getting here, this guy who had applied to teach European politics was placing Latina students into groups like Korean Immigrant Workers Advocates,” Boyle said. As a professor and Fulbright adviser, Boyle has found many Pitzer students to be single-minded in their demand for a multi-faceted education. They volunteer, study abroad and design their own majors. “Students are often looking for ways to connect things that they’re doing locally to things they’re doing in Ecuador, then thinking it through critically,” Boyle said. IGLAS began to take shape in 2004 with a planning grant from the Andrew W. Mellon Foundation. Subsequent support from Mellon, the Christian A. Johnson Endeavor Foundation and individual donors have funded paired courses, international faculty and student research projects, junior faculty research trips and curriculum development. The author of Crafting Change: Labor Market Policy under Mrs. Thatcher and FAS and Active Labour Market Policy 1985-2004, Boyle received his PhD from Duke University and holds an undergraduate degree from Liverpool University.